covered storage and onward UK-wide road distribution for timber products imported through the port. Ian Attwood, managing director for International Plywood, said: “International Plywood has been importing plywood and panel products for a quarter of a century. We are a family-owned company and in this extremely competitive market, we pride ourselves on always striving to achieve value for money for our customers. 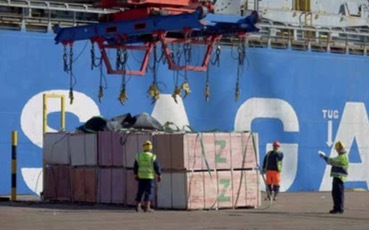 Multi-geared breakbulk vessels will import plywood and other timber products to the Port of Tyne from the Baltics and as far afield as South East Asia and South America. Nolan Gray, business development director for Port of Tyne, said: “The Port of Tyne is unique in its ability to not only manage break-bulk of non-containerized cargo but to also handle containerized products, storage and distribution providing optimal customer service. The Port of Tyne is one of the UK's major deep-sea ports — a vital trading gateway to worldwide markets. The port operates five business areas including bulk and conventional cargo, car terminals, cruise and ferry, logistics and a commercial property portfolio.